Our group recently moved from Mainz to Heidelberg. Applications of master students and MD students interested in a research project are highly welcome. We are interested in the development and regulation of inflammatory processes in autoimmunity and infection. Our animal models are skin inflammation models such as Imiquimod-induced dermatitis as model for psoriasis and experimental autoimmune encephalomyelitis (EAE) as model for multiple sclerosis (MS). We are interested in pro-and anti-inflammatory mechanisms of the cytokines IL-17, IFN-γ and IL-22 and IL-22BP and how pathogenic αβ and γδ T cells develop and are regulated. We use for our experiments genetically modified mice with conditional gene deletion or overexpression. Furthermore, we work with human samples and patient material. Our methods are largely immunological in vivo and in vitro methods. Flow cytometry plays a major role for our experiments for cell analysis and sorting. IL-17 signaling in the skin: In this project we analyze which cells in the skin need to respond to IL-17 to combat S. aureus infections and which impact this signaling has on the regulation of IL-17-expressing γδ-T cells and Th17 cells in the skin. Funded by the Deutsche Forschungsgemeinschaft (DFG) Trans Regio TR156/C01 to Ari Waisman and Florian Kurschus. EBI2: One of our major projects is to define the impact of the G-protein coupled receptor EBI2 in inflammation and its implications for the human immune system especially in psoriasis and MS.
PI3K-AKT: In this project we investigate the impact of phosphoinositide 3-kinase (PI3K) and of protein kinase B (AKT) on T cell development and on autoimmunity. IL-22-IL-22BP: In this project we are interested in the regulation of IL-22BP in dendritic cells in inflammatory setting and work with human cells and mouse models in this context. Kurschus FC *and Moos S. IL-17 for therapy. Review in J Dermatol Sci. 2017 Sep;87(3):221-227. Wanke F, Moos S, Croxford AL, Heinen AP, Gräf S, Kalt B, Tischner D, Zhang J, Christen I, Bruttger J, Yogev N, Tang Y, Zayoud M, Israel N, Karram K, Reißig S, Lacher SM, Reichhold C, Mufazalov IA, Ben-Nun A, Kuhlmann T, Wettschureck N, Sailer AW, Rajewsky K, Casola S*, Waisman A*, and Kurschus FC*. EBI2 is highly expressed in multiple sclerosis lesions and promotes early CNS migration of encephalitogenic CD4 T cells. Cell Reports. 2017 Jan 31;18(5):1270-1284. Croxford AL, Karbach S, Kurschus FC, Wörtge S, Nikolaev A, Yogev N, Klebow S, Schuler R, Reissig S, Piotrowski C, Brylla E, Bechmann I, Scheller J, Rose-John S, Wunderlich FT, Munzel T, von Stebut E, Waisman A. IL-6 Regulates Neutrophil Microabscess Formation in IL-17A-Driven Psoriasiform Lesions. J Invest Dermatol 2014;134:728-35. El Malki K, Karbach SH*, Huppert J, Zayoud M, Reissig S, Schüler R, Nikolaev A, Karram K, Münzel T, Kuhlmann CR, Luhmann HJ, von Stebut E, Wörtge S, Kurschus FC*, Waisman A. 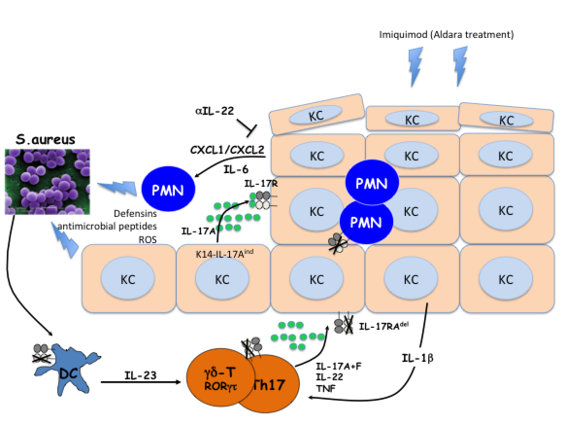 An alternative pathway of imiquimod-induced psoriasis-like skin inflammation in the absence of interleukin-17 receptor a signaling. J Invest Dermatol. 2013 Feb;133(2):441-51. Yogev N, Frommer F, Lukas D, Kautz-Neu K, Karram K, Ielo D, von Stebut E, Probst HC, van den Broek M, Riethmacher D, Birnberg T, Blank T, Reizis B, Korn T, Wiendl H, Jung S, Prinz M, Kurschus FC, Waisman A. Dendritic cells ameliorate autoimmunity in the CNS by controlling the homeostasis of PD-1 receptor(+) regulatory T cells. Immunity. 2012 Aug 24;37(2):264-75. Kurschus FC*, Croxford AL, Heinen AP, Wörtge S, Ielo D, Waisman A. Genetic proof for the transient nature of the Th17 phenotype. Eur J Immunol. 2010 Dec;40(12):3336-46. Pöllinger B, Krishnamoorthy G, Berer K, Lassmann H, Bösl MR, Dunn R, Domingues HS, Holz A, Kurschus FC*, Wekerle H*. Spontaneous relapsing-remitting EAE in the SJL/J mouse: MOG-reactive transgenic T cells recruit endogenous MOG-specific B cells. J Exp Med. 2009 Jun 8;206(6):1303-16. Kurschus FC, Fellows E, Stegmann E, Jenne DE. Granzyme B delivery via perforin is restricted by size, but not by heparan sulfate-dependent endocytosis. Proc Natl Acad Sci U S A. 2008 Sep 16;105(37):13799-804. Fellows E, Gil-Parrado S, Jenne DE, Kurschus FC*. Natural killer cell-derived human granzyme H induces an alternative, caspase-independent cell-death program. Blood. 2007 Jul 15;110(2):544-52. Kurschus FC*, Bruno R, Fellows E, Falk CS, Jenne DE. Membrane receptors are not required to deliver granzyme B during killer cell attack. Blood. 2005 Mar 1;105(5):2049-58.